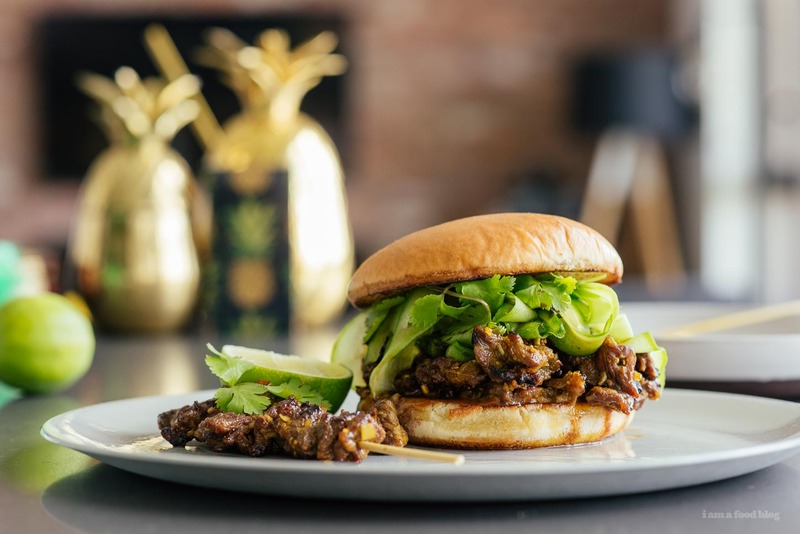 Sweet, spicy, addictive charred meat on a stick, popped into a soft bun with cucumbers, cilantro, and a squeeze of lime. Summer road trips are the best. So far we’ve seen the world’s largest axe, boughten fresh strawberries from a roadside stand, and eaten so many fresh cut fries. The fresh cut fries on this side of the world are a whole different beast. The potatoes are as fresh as can be – they grow a LOT of potatoes here and they’re thick cut and not as crisp as fries I’m used to, but taste more potato-y as well. I’m kind of sort of addicted, especially with lots of white vinegar and salt. You know what else I’m addicted to? Meat on a stick. Who doesn’t love meat on a stick? Meat on a stick was, is, and always will be one of my favorite ways to eat meat. 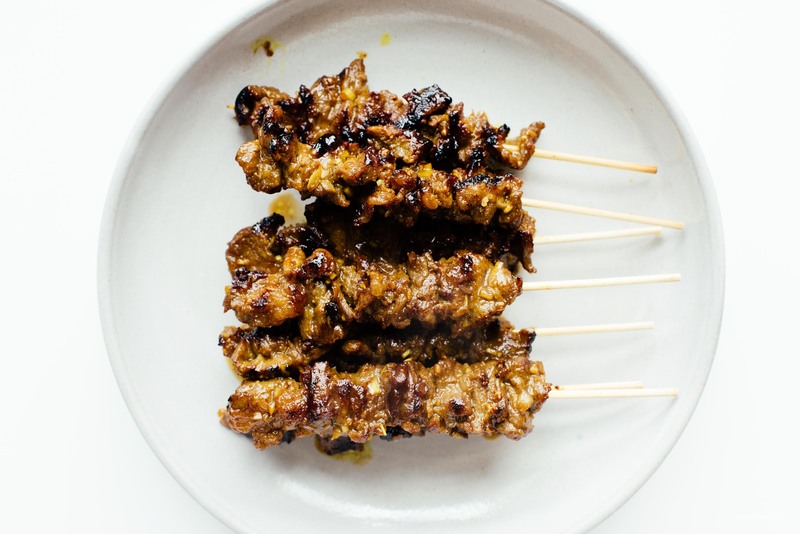 When I was young, my mom would marinate pounds and pounds of chicken meat and then put me to work skewering chicken satay. I didn’t like how my hands got stained a peculiar yellow color (turmeric, it stains everything), but I could eat stick after stick of smokey, charred, flame-grilled satay, dipped in peanut sauce. Growing up, we only ate chicken satay, so my mind was blown when I discovered that there are all kinds of satay out there. 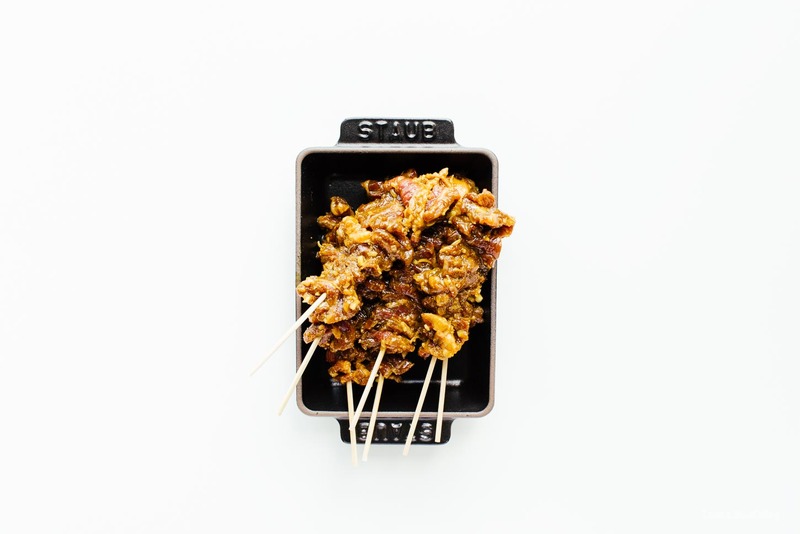 Satay, by the way, if you haven’t heard of it, is Indonesian seasoned, skewered, grilled meat served with a dipping sauce. 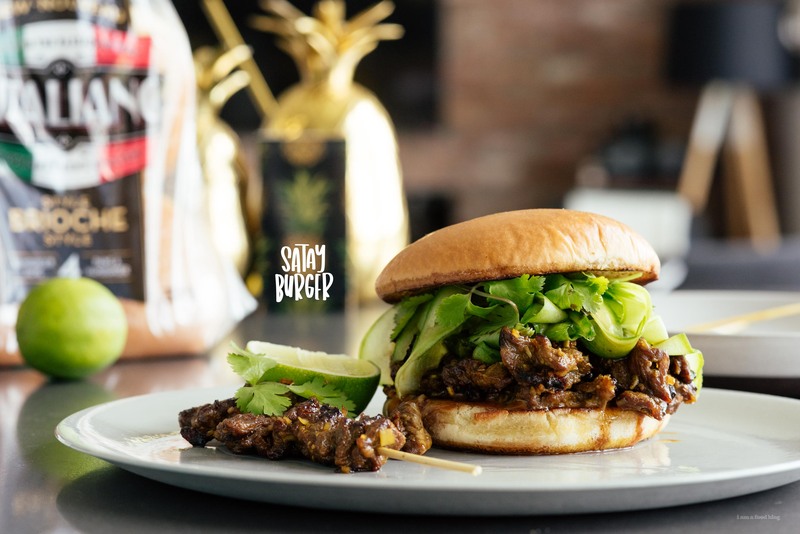 They make satay out of almost every protein, and even out of vegetables. 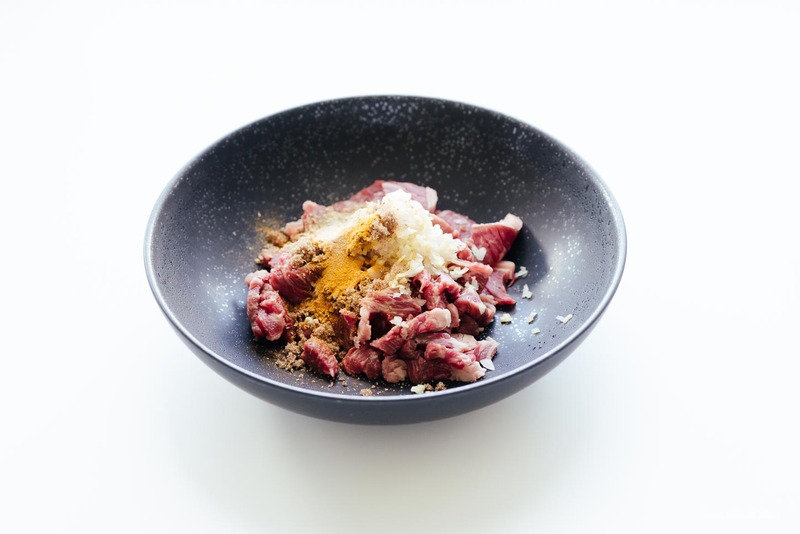 In a bowl, mix together the thinly sliced beef and marinade ingredients. Let marinate for 30 minutes minimum, or overnight. Skewer onto bamboo skewers and grill over a lightly oiled grill on medium heat, flipping, until cooked through and slightly charred. Or, heat up a frying pan over medium high heat and add a touch of oil to the pan. When hot, add the meat and cook, moving around the pieces of meat. Cook until slightly charred and crispy. 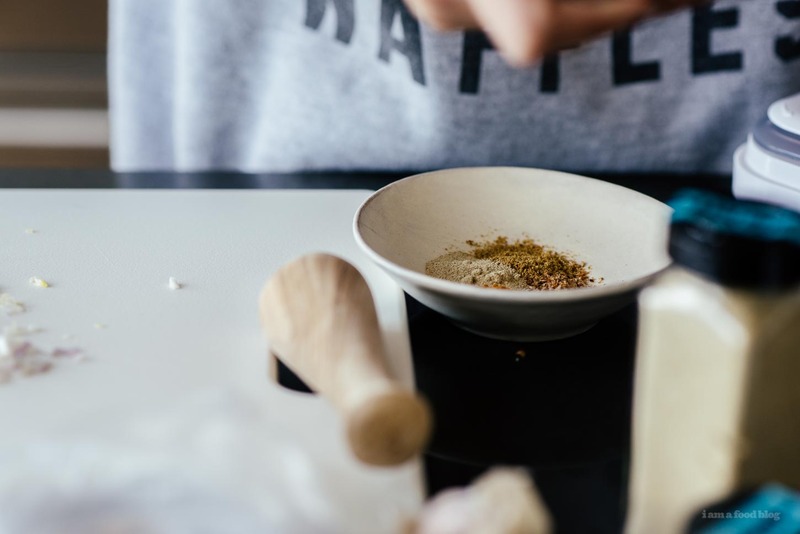 Toast the buns, if desired and spread on mayo to taste. 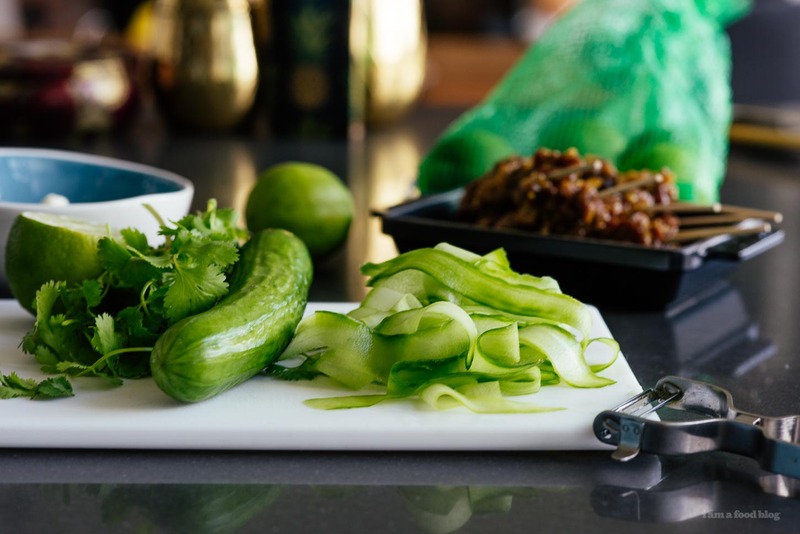 Top with grilled satay, cucumber, and cilantro. 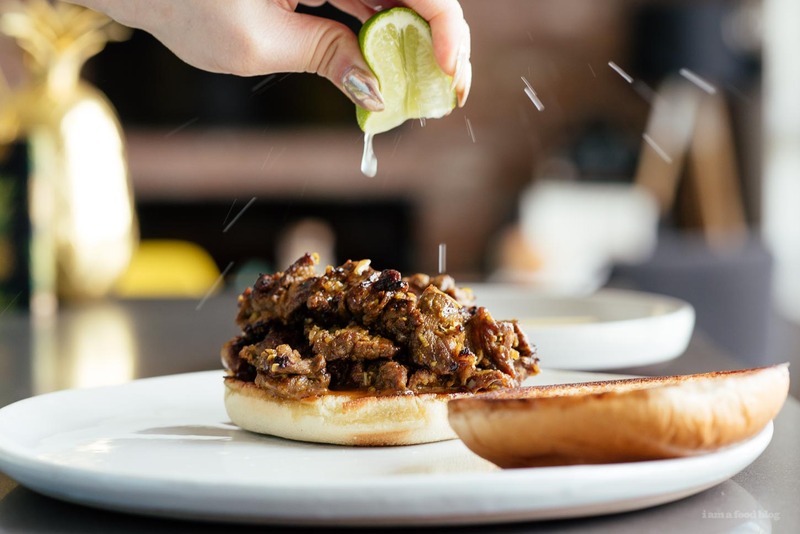 Squeeze on the lime and an extra drizzle of kecap manis, if desired. 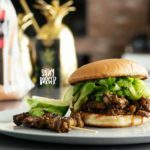 I partnered with 150 Buns of Summer to create this post! I love this slaw on the beef! YUM!! This sounds right up our dinner alley… Although, I can’t eat red meat (well, really just beef), do you think pork would work? Or b-less skinless chick. thighs? 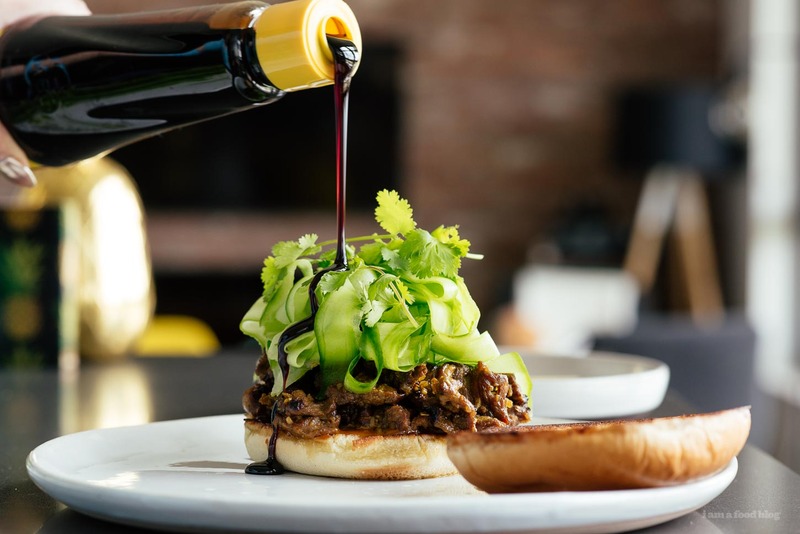 I had to look up what kecap manis is, haha! I feel very un-smart. But sounds delicious! Super excited for the city to lift the grilling/bbq ban in Seattle due to poor air quality from the BC fires. Air is so smoky!!! Pinning this to make, when I can FINALLY grill again! Vegan(!) Creamy Corn Soup Recipe and a Giveaway!